After a decade, taxpayers have invested $135M in The Banks. Did we get the return we were promised? CINCINNATI -- A decade ago, when city and county officials inked a development deal to transform Cincinnati’s riverfront, they promised to spend $106 million on the project. While taxpayers have upheld their end of the bargain, spending $135 million to construct The Banks over the last 10 years, private investment has been slow to catch up. There’s an old newspaper clipping, published the day after The Banks deal was finalized, that hangs in Hamilton County Commission President Todd Portune’s office. “Now, it’s developers’ turn to raise $600M to $800M share,” the bold headline reads. 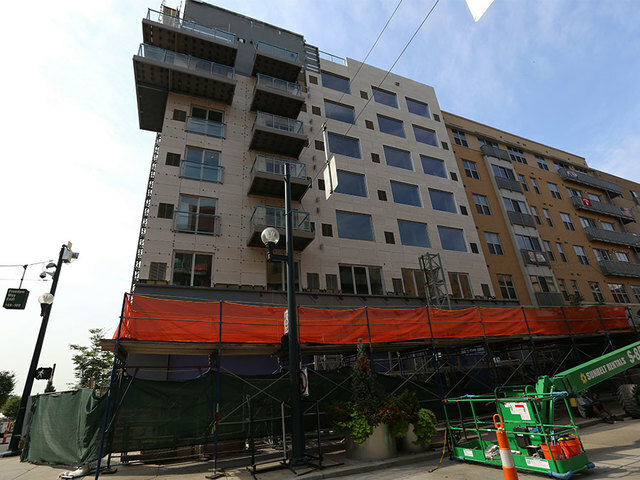 But 10 years and two phases later, that private investment – from new offices to apartments — has totaled just $280 million so far. Public leaders hoped when they signed off on the project that the mud pit on the river would soon be filled out with condos, retail shopping and an entertainment venue. Those key amenities have yet to materialize. Still, The Banks is not without its major successes: More than 1,400 workers fill General Electric’s Global Operations center, families flock to the $98 million Smale Riverfront Park every weekend and a new luxury hotel is slated to open in September. More than 5,000 jobs have been created along Ohio's revived riverfront. That’s not enough for former Cincinnati City Councilman Chris Bortz, who helped to oversee the agreement that launched The Banks. Carter, the lead developer on The Banks project for 10 years, exited the project last month after missing two key deadlines to start new phases . Critics are hopeful a new firm will revive a faded vision. A nationwide search for a new master developer is expected to begin next month. “Miraculous” and “absolutely incredible” are a few of the ways Reds owner Bob Castellini has described The Banks. Castellini chairs the powerful Joint Banks Steering Committee that guides the decision-making on the development. He remembers when concrete, parking lots and dirt surrounded Riverfront Stadium, where the Reds played 15 years ago. Now, restaurants, green spaces and a streetcar route flank Great American Ball Park. No one can deny the view is a big improvement. Still, the location has yet to enjoy the same fanfare as places such as Over-the-Rhine, which underwent a drastic transformation during the same time as The Banks. The architecture, which critics say looks too suburban, has left some underwhelmed. Aaron Betsky, the former Cincinnati Art Museum director, often chided the development’s design before he left the city two years ago. “All I can say is that they could start by tearing down those gimgrackity monstrosities they built and come up with a better plan,” Betsky wrote in an email about The Banks’ future. Others worry about The Banks' long-term viability – especially during the Bengals’ and Reds’ off-season. More than six restaurants have closed in two years. In some cases, plans to open new bars or restaurants at The Banks failed to launch . Initial projections called for as much as 2.8 million square feet in restaurant, hotel, apartment and office space development. Today, nearly half that space has been filled with 1 million square feet in development. Metal stakes and concrete blocks poke out of from the newest parking garage, paid for with public tax dollars. 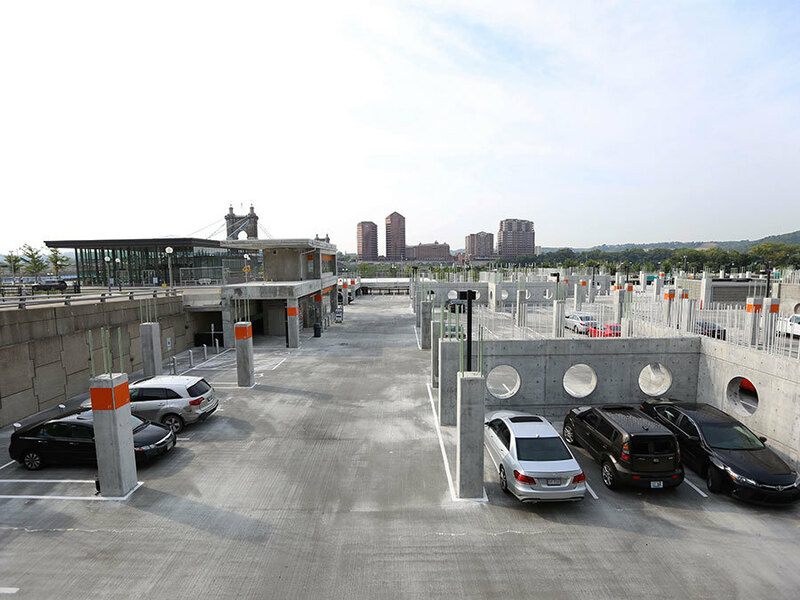 While the county and city moved forward on opening more than 700 spaces in the parking garage last year, Carter failed to launch the next phase and secure a new development to locate above that garage for more than a year. Still, that doesn’t stop GE workers, politicians and stadium security employees from crowding the new Taste of Belgium restaurant for lunch on a sunny Wednesday afternoon. Mike Glotfelter, a retiree who relocated from Clermont County to an apartment at The Banks six years ago, said he’s noticed an uptick in traffic since GE moved in. He believes the construction of a new Downtown Kroger, which will be a half-mile walk from The Banks, will be a big boost, too. To Jack Rouse, the former chairman of the Riverfront Advisory Committee that charted out plans for The Banks more than 20 years ago, Smale Riverfront Park is the project's crowning achievement. Restaurants, he said, will come and go but the park will remain a unique offering in the city for years to come, he said. He credited former Cincinnati Parks Director Willie Carden for raising the money needed to open the park. "There's plenty of riverfronts that have buildings on them," said Rouse, now a professor at Columbia University who splits his time between Cincinnati and New York. "There's not as many riverfronts that have such exquisite parks as we do have on The Banks." 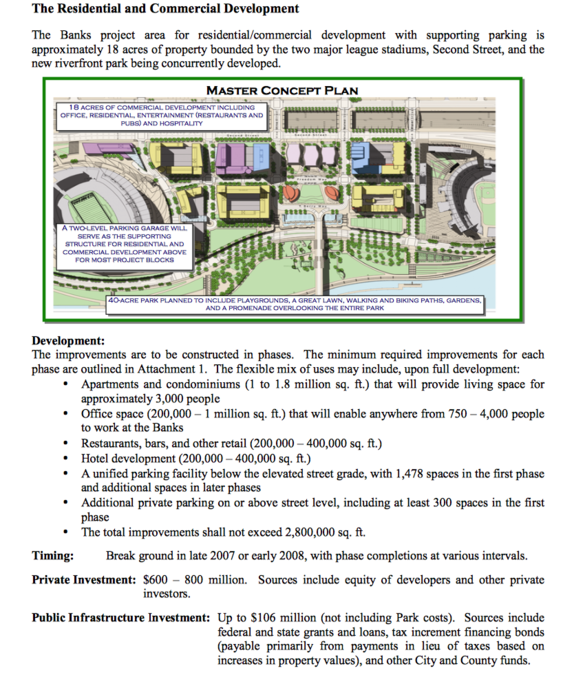 The initial master plan for The Banks, developed 10 years ago. The next developer should focus on filling empty spaces with more businesses and corporations, said University of Cincinnati economic professor Michael Jones. Jones specializes in studying public-private partnerships. With the development offering a mix of apartment towers, a park and restaurants, Jones said The Banks is in a good spot to land more corporate centers like GE’s Global Headquarters. He added that the city shouldn't need to incentivize future companies with big tax breaks to relocate, like it did with GE. Another corporate headquarters is top of the list for The Banks for Hamilton County Commissioner Denise Driehaus. Stakeholders have also mentioned a new venue that could host indoor and outdoor concerts as a top priority, and local businesses have shown interest, although no movement has been made yet. Last month, Banks Steering Committee members also asked about the idea of adding condos to the mix – a plan for The Banks that was nixed after the housing market crashed in 2008. A push to expand the park is also underway. For Bortz, the former city councilman who’s critical of how The Banks has shaped up, the wrong developer threatened the project's success from the very beginning. 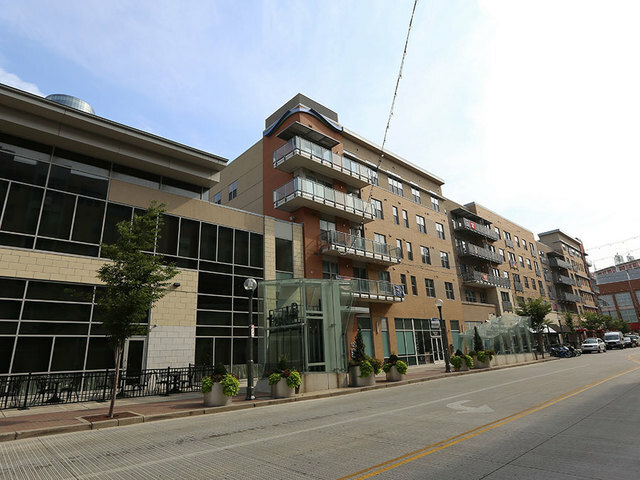 When city and county leaders – Bortz included – hired Carter a decade ago, another real estate firm had agreed to fund and develop the project. That firm dropped out just months before its groundbreaking. That left The Banks with Carter as the master developer. City and county leaders began looking at Carter for The Banks’ after flying on Castellini’s private jet to Atlanta for a tour of Atlantic Station, a project Carter worked on. Carter wasn’t the lead developer on Atlantic Station but city and county leaders -- who didn’t take a similar out-of-state tour of any other developer’s work -- were taken with what they saw. Bortz expressed concerns at the time with leaving the project entirely in Carter's hands. Now he hopes a new developer can move the project in a better direction. Last month, as Carter announced its exit from the project, city and county leaders hailed the team’s work. “We applaud Carter for successfully positioning the County toward an optimistic future at The Banks,” Portune said in a statement last month. The hunt is now on for a new developer. The Joint Banks Steering Committee is expected to meet later this month to decide what they’re looking for in a new project manager. Experience handling a destination development along a waterway is a top priority, said Tom Gabelman, the private attorney the county has hired for The Banks. A new developer could be selected by the end of the year. He’s been researching waterfront projects across the country, looking at what’s been successful – and what’s fallen flat. A developer with an international portfolio and experience landing big companies – not just retail – would be ideal for the job, Jones, the UC economic professor, said. The project is likely to be attractive for developers. There’s a big difference between the city that was looking for a developer to break ground on an experiment along the river 10 years ago and the Cincinnati that exists today. Since then, a recession has come and gone. The county and city have invested millions of dollars in parking garages and the city’s park system raised money to complete Smale Riverfront Park. Potential developers will take the huge county and city investments as a good sign, Gabelman said. Still, there’s plenty of room for a new developer to leave their own mark on The Banks. A new developer would likely start next year, putting The Banks’ on track to be completed no sooner than five to six years from now, he added. The Banks Steering Committee will decide the criteria and make a recommendation on the next developer, but the county and city will have the final say. Gabelman said the county will consider developers who have new ideas – different from the vision developed a decade ago. Interactive designed by WCPO's Brian Niesz.